It was an impressive sight! 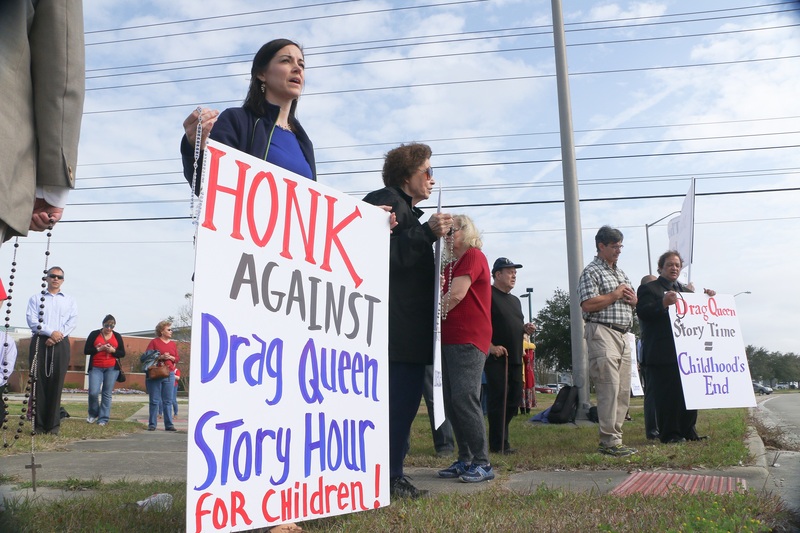 On February 3, Super Bowl Sunday, people of every walk of life gathered for a “Rosary of Reparation and Protest against the Drag Queen Story Time” in front of the Lafayette Public Library – South Regional branch. 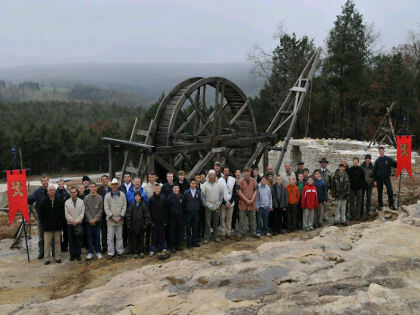 The protest was organized by Tradition, Family, Property – Louisiana. The crowd that assembled on short notice surpassed the adults corralling a dozen poor children in a room inside the library. 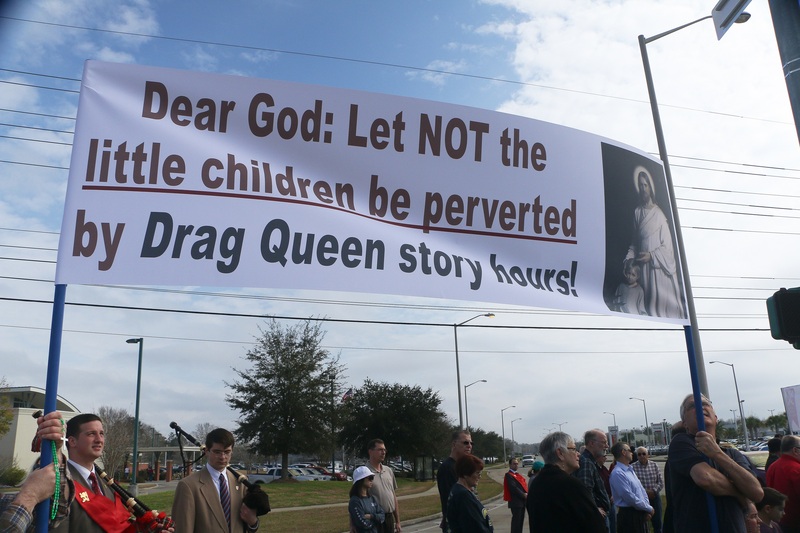 These events feature men dressed as drag queens who read stories to 3-6 year-old children. Local libraries nationwide are pressured to hold these story times as a way to introduce gender ideology into the mainstream. Concerned citizens have responded by protesting what they see as the corruption of children’s innocence in a public forum at taxpayer’s expense. The public received the protest with enthusiastic honking of support. Three local TV channels were on site to report on the story time and noted the unexpected reaction to the library program. An earlier attempt to hold the event led to its cancellation last year when public uproar forced the administrators to back down. 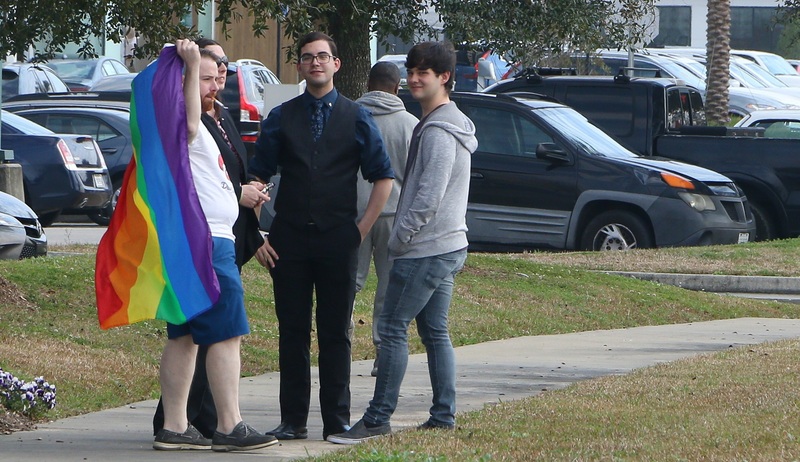 Word of the February event leaked out, and TFP-Louisiana managed to organize the protest. A couple TFP members played the bagpipes. The inspirational music performed with youthful vigor was a marvelous contribution to this public act of reparation and protest.